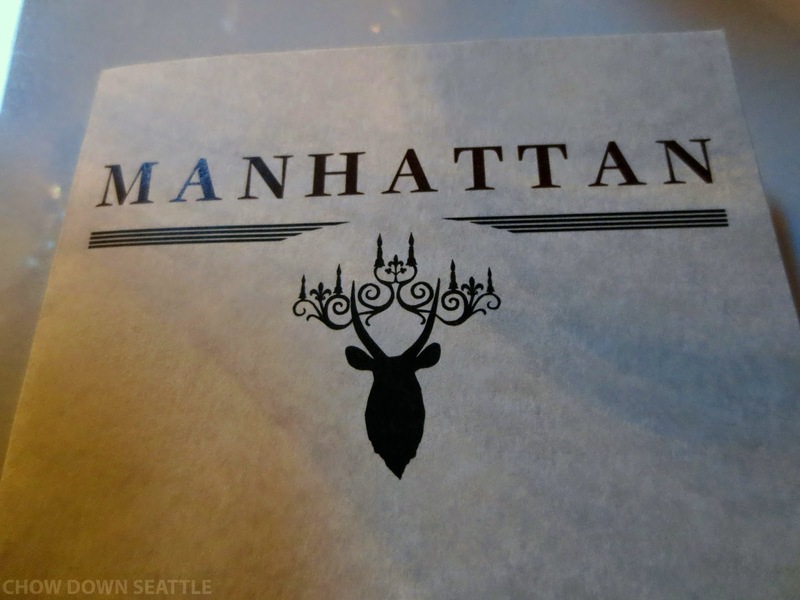 Over the weekend I paid a visit to Manhattan on Capitol Hill for dinner with some friends. Manhattan is located on 12th Avenue between Madison and Pike. As the name implies, the food is inspired by the east coast. 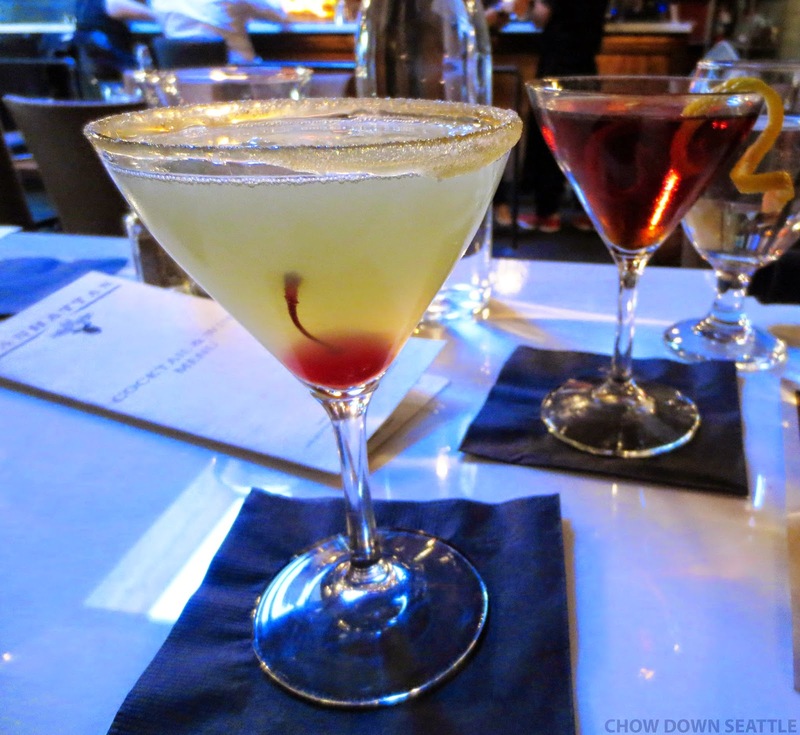 Manhattan has a craft cocktail bar that serves classic drinks as well as their own signature cocktails. I ordered a Salted Caramel Apple cocktail that was very tasty! It's vodka, apple liqueur, lime juice with a sweet and salty caramel rim. This cocktail was like drinking dessert! I loved the caramel around the rim of the glass, and it was the perfect combo to the taste of the apple and lime. The cherry in the glass was perfect contrast to the beautiful color of the cocktail. I also tried the Manhattan(2). It is a twist on the classic with rye, punt e mes (Italian Vermouth), peychaud's (bitters), orange bitter and served with an orange twist. Strong, but tasty! Manhattan offers a good selection of food on their menu, from seared scallops, to fried chicken, to filet mignon. I went with the Grilled Duck Breast. This was served with grits, brown butter and sage, seasonal vegetables (carrots, asparagus, squash), and red wine sauce. 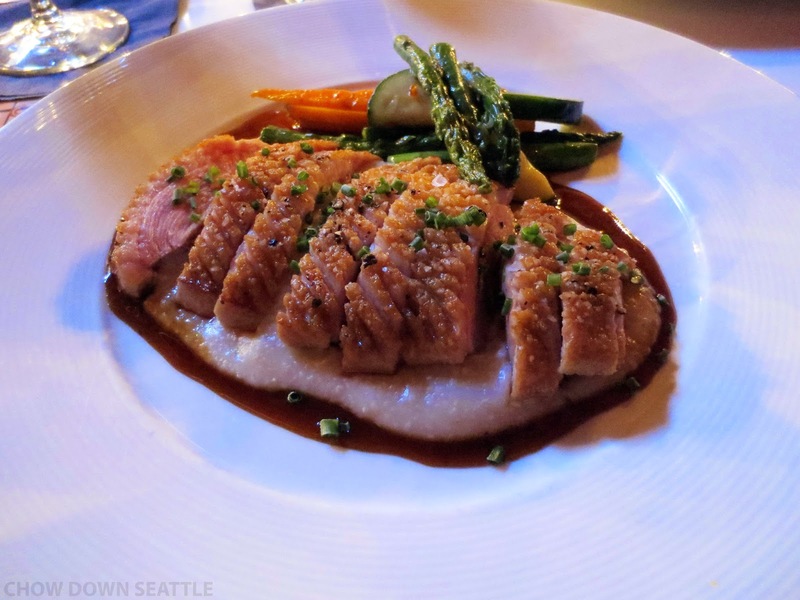 The duck breast was beautifully served pre-sliced on an island of grits surrounded by red wine sauce. The duck was cooked perfectly. The skin was nice and crispy and beautifully scored. It was tender and juicy, and the perfect bite included the duck with some grits dipped in the red wine sauce! There was even some thought placed in the presentation of the seasonal vegetables. Cut to nice bite-sized portions and perfectly prepared. 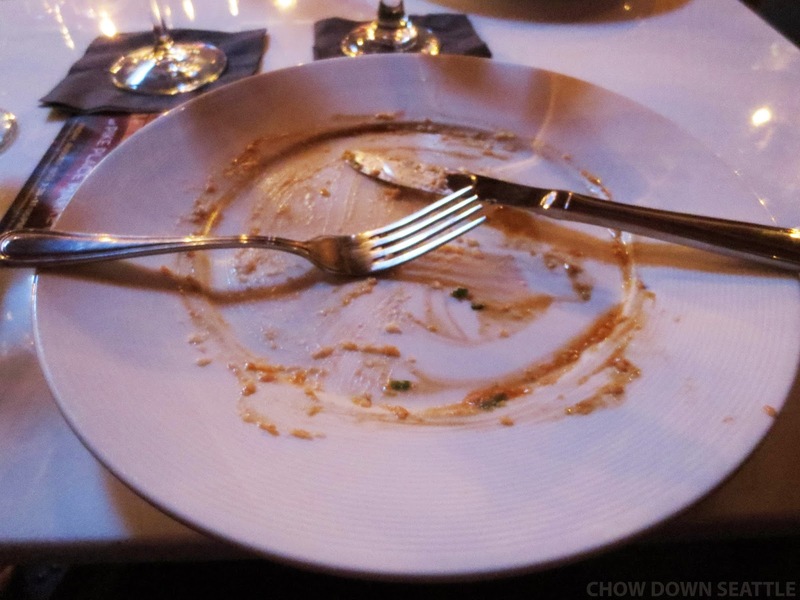 As you can see from my empty plate, I thoroughly enjoyed my dinner! I really like the interior of Manhattan. We were seated in one of the booths located along the wall opposite the bar. There are tables through the middle of the restaurant, as well as tables with bench and chair seating near the front of the restaurant. 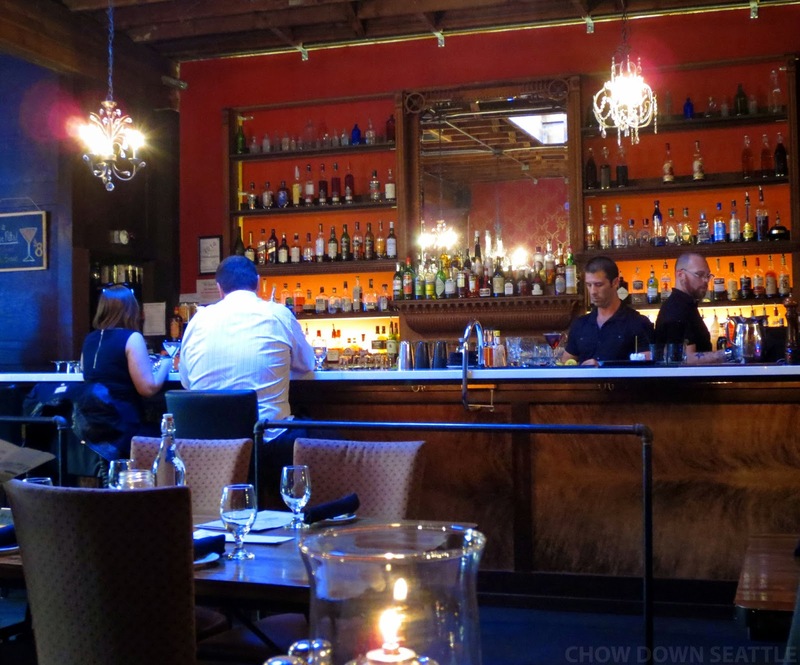 The big orange wall behind the bar glows in the back light, as the rest of the restaurant is lit with different alternating vintage looking chandeliers. The decor is definitely chic, but comfy. On my next visit, I would love to just sit at the bar and try some of their other signature cocktails and some more of their delicious food. 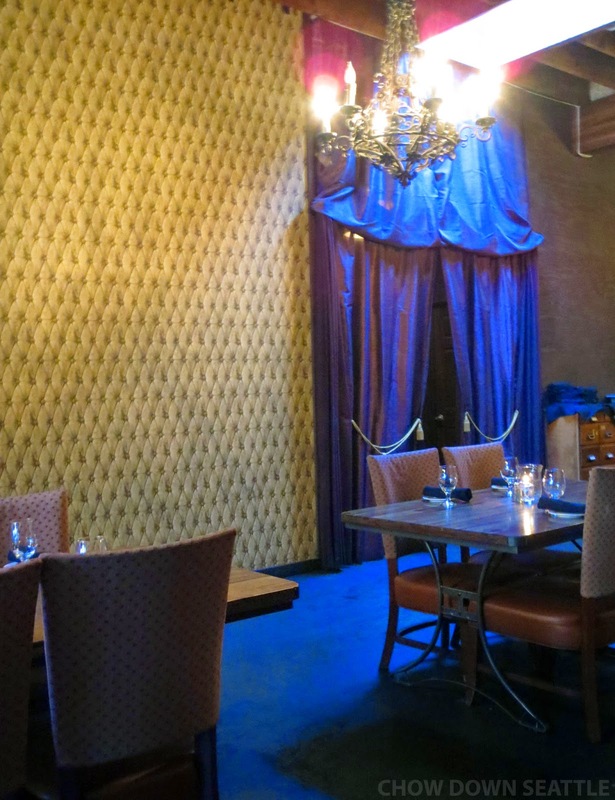 Manhattan has two tufted walls with the others covered in patterned and textured wallpaper. The entrance to the restrooms is draped off with dramatic, heavy curtains. 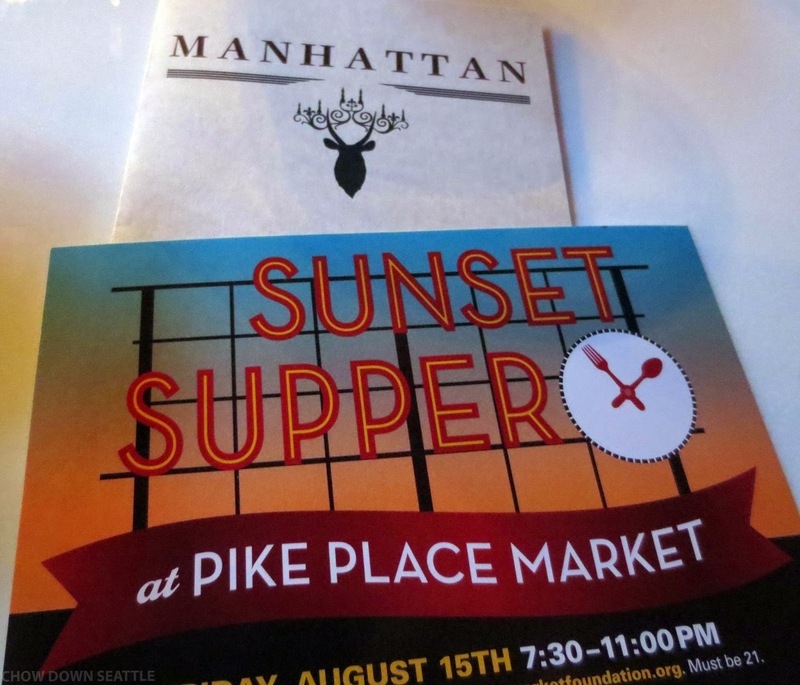 Manhattan is also taking part in the Sunset Supper at Pike Place Market on August 15th. Check out my previous post about the Supper, or go to The Pike Place Market Foundation website for more info.